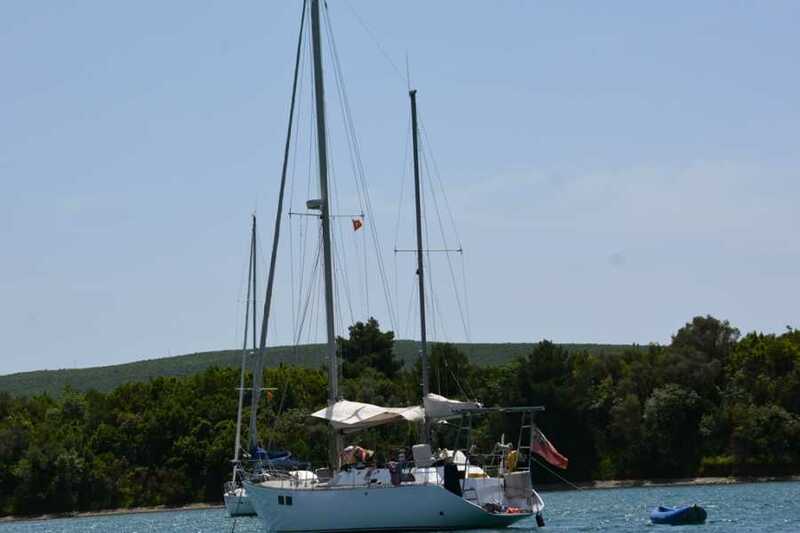 MH Travel is the only travel agency in Montenegro which organizes sailing tours for shared costs of sailing. This is a very good sailing option for budget travelers, individuals or small groups. We organize one and two days sailing only in the Bay of Boka, which is the most attractive part of Montenegrin coast. In comparison with Croatia, Montenegro doesn't have a lot of islands, just two bigger and several islets. The most attractive part for sailing in Montenegro is Boka Bay. Two days sailing gives guests option to sail around the Boka Bay including the sail on open sea next to the biggest peninsula in Montenegro named Prevlaka. The itinerary which we will describe is highly recommend, but if the customers want to make a break somewhere else in Boka Bay, or don't want to stop, this is also possible. We will start from port in Kotor at 8:00 am. and sail to Preast which will take about a hour. Cruise ships in port of Kotor probably will limit us to use only engines, not sails in that first part of the sailing trip of 30 minutes. Guest will enjoy the lovely panorama of Kotor Bay and villages: Prcanj, Stoliv, Ljuta and Orahovac. Visiting Perast or the island Our Lady of The Rocks are up to the guests decision. To visit both places we would need about 90 minutes, and it is not planned on this trip, but if the guests insist we will stop for a visit. After Perast we will use sails and pass through 250 meters wide Verige (entrance/exit) of the most significant points of UNESCO area of Kotor and Risan Bay. Next to Verige is a ferry route from Lepetane to Kamenari, from one side of Boka Bay to another. This is also the beginning of Tivat Bay, very popular for sailing and water activities. The biggest island in Tivat Bay is St. Marco Island. It is aligned with the Tivat’s other small Prevlaka Island. The side of the island with the view on peninsula Lustica and villages Radovići and Krašići have crystal clean water and several quiet oasis for swimming break. The island is entirely covered with greenery. In 1962, a tourist settlement was built there, with 500 Tahiti-style houses, without water supply or electricity. It was managed by Club Med, and until the Yugoslav wars, it was a very popular tourist destination, especially for nudists.Next to the St. Marco is islet Our Lady of the Grace, the smallest island of the Krtoli archipelago, is one of the most beautiful sights in Tivat Bay. It is the less famous ‘brother’ of the Boka’s other island, the shrine Our Lady of the Rocks near Perast. However, unlike Perast’s island which was artificially created by adding materials onto the underwater reef, Tivat’s island has a natural origin. On this small islet (it is only one hundred and fifty meters in size) is a Franciscan monastery and church dedicated to Our Lady of Grace, which was built in the second half of the 15th century. The church is not open for visitors. We will continue from Tivat Bay to Herceg Novi Bay and to port of Herceg Novi and spend the night there.‘Novi’ means ‘new’, and while this is indeed one of the newer towns in the bay. It was founded in 1382 by Bosnia's King Tvrtko I. ‘Herceg’ refers to Herceg (Duke) Stjepan Kosača, who fortified the town in the 15th century.The port of Herceg Novi is next to the old town and very charming and relaxing promenade named Five Danica's with a lot of excellent restaurants and taverns. The next morning we will start sailing to peninsula Luštica and to its most popular parts: village Rose, beach Žanjic and Mirište. The distance is 1,7 nautical miles. Rose is a typical Mediterranean village with detached houses lined along the pier – seafront. Žanjic is situated in the Mirište valley, deeply pulled in the dry land of the Lustica peninsula, 3.8 miles away from Herceg Novi. It is surrounded by old olive groves and azure sea water. The beach is covered with white pebbles. It is 300 meter long, 15 meter wide and its capacity is 1000 people. Mirišta beach are next to Žanjice and have a lovely restaurant with concrete terraces and rocky beach leads to Fort Arza, the most popular attraction there. There is a small islet with orthodox monastery and church Maria de Sagnic from 16th century.The most famous island there is Lastavica or Mamula. Built in 1853, the first life of the Island of Mamula was that of an Austro-Hungarian military fort. The island, however, became most notorious during World War II for the isolated concentration camp built atop the footprint of the former’s ramparts.Today, Mamula is being renovated into a luxurious hotel resort, so the visit of the island is not possible until 2023 when the Mamula hotel will be open for guests and visitors. After 30 minutes of sailing south of Mamula we will come to the Blue Cave. This is one of the must-see attractions while you are on the coast. A unique feature of the Blue Cave is that the time of day greatly affects the color of the rippling water, from light blue in the morning to dark blue at mid day, and back again to light blue before sunset.Swimming in the blue cave is the highlight of the day. Then we will continue via village Veslo to Lustica Bay where the tour ends for the guests who want to stay there and go back to Kotor by taxi (taxi ride costs around 15 euro). Distance from Lustica Bay to Kotor is 18 km. Emulating the traditional fishing villages along the Adriatic coast, the heart of Lustica Bay is its marina. It is the perfect jumping-off point as well as a place to soak up the energy and charm of the marina village. Lustica Bay will include two first-class marinas and provide a luxurious and convenient passage to life on the coast, offering all the yachting and marina services seafarers could need. Marina offers a several waterfront restaurants, cafes and bars with unparalleled service, style and comfort. Five starts hotel Chedi is highly recommended for the lovely dinner and sunset. You will be surprised by the affordable prices you can find in Chedi as well in other restaurants in Lustica Bay. Guest who don't want to stay in Lustica Bay, can go back to Kotor with the skipper. We should arrive in Kotor by 21:00. Equipment: Roller-furling mainsail 27 m², Roller-furling genoa 36 m², Tachometer, Depth gauge, Safety equipment, Navigation tools, Bimini top, Cockpit table, Clock and Barometer, Coolbox, Stove – gas, Hot water, Cutlery set, Shore supply 220V, Electric anchor windlass, Toilet, Cockpit shower. Tour ticket can be bought on-line via BOOK NOW! option, or directly at the reception of Montenegro Hostel B&B Budva (address: Vuka Karadzica 12, next to cafe Greco, located in the old town of Budva) and Montenegro Hostel B&B Kotor (address: Stari Grad 333, next to the restaurant Regina del Gusto located in the old town of Kotor). The last booking is possible to make up to 7 days before departure. Guests can prepare their own food on the boat, or they can make stop to some restaurant to have a lunch.